Judith Mirembe of Kampala, Uganda. All photos courtesy of Judith Mirembe unless noted. Girl power is ascending the international birding scene. No where am I more excited to see women leading the charge than in bird guiding, and in particular, women country nationals entering the lucrative and male-dominated world of nature tourism in the world’s birding hot spots. Today’s post features one such young woman, Judith Mirembe, and the organization Uganda Women Birders she chairs to train other Ugandan women in nature tourism. Mirembe, 27, is the co-founder with Herbert Byaruhanga (Director of Bird Uganda Safaris) of the Uganda Women Birders Association, formed in May 2013 to remedy the gap of women involved in nature guiding in Uganda. At the time of the club’s founding, Mirembe was a university student and intern for Bird Uganda Safaris, and saw first hand the opportunity for women to enter the field, but also the challenges. I learned about Uganda Women Birders on the Facebook group World Girl Birders, the immeasurably helpful resource for female birders founded by Debi Love Shearwater. It quickly became obvious to me that the Uganda Women Birders Association was totally distinct in its existence as a resource to women on the ground supporting female birding and nature guides. I don’t know of such an association even in the US, where I live! An exciting development earlier this month brought together bird guides from around the world—many of them women—with Mirembe and her Ugandan colleagues. Uganda hosted the Second Annual African Birding Expo, which took place in Entebbe along Lake Victoria December 6 to 8, 2018. Among the international group of birding guides were renowned Americans Sharon Stiteler, the Bird Chick and Megan Crewe of Field Guides Birding Tours Worldwide, and two young Rwandan birding guides, Jeanisse Nsanga and Pamela Giramata Gasana. While Stiteler and Crewe wowed the young Uganda Women Birders with advice and tips, Mirembe knows her group’s work is in turn changing the scene on the continent. “I am proud to recognize the Uganda Women Birders as the only organization in the world training women in Nature guiding, a male dominated profession. We are currently inspiring other ladies from other countries to start up this initiative in their respective countries,” she said on Facebook accompanying a photo of herself and vice-chair Prossy Nanyombi with their Rwandan colleagues. 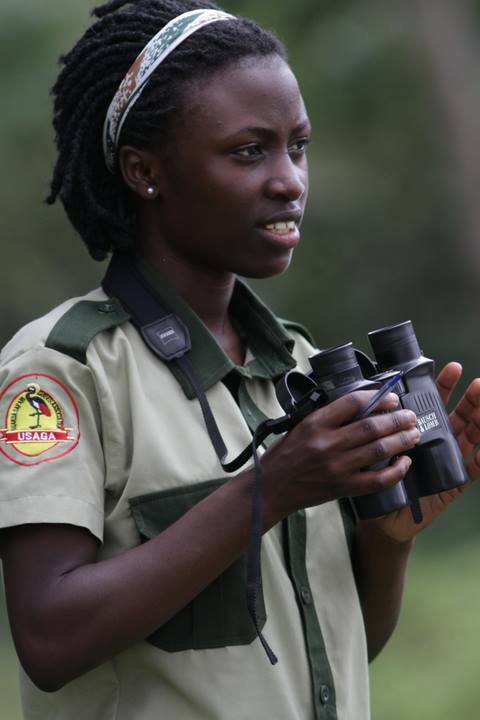 In addition to chairing Uganda Women Birders, she is finishing her Masters at Makerere University in Kampala (studying Shoebills and community conservation), is a current EDGE Fellow, and works as a birding guide. She’s traveled to birding expos in Europe and North America as a representative for Ugandan Eco-tourism. And she’s not stopping there, as you’ll read in the interview below, conducted over email and Messenger in November and December, 2018. How has the Uganda Women Birders Association grown since its founding? Judith Mirembe: The club started with a few ladies who were already established in the Nature Guiding world and we thought these few would inspire the others to join the club. We started with about 10 women and the membership grew to include 20 other new members and currently (we have) about 50 with 30 active members. However these numbers are in balance as the number of ladies joining is equal to that of the ladies leaving. Most of the ladies joining as fresh graduates join with a purpose of looking for a job and tend to move immediately (once) they find a job. Most of these (jobs) are not necessarily practical and some are not at all related to guiding. Mirembe with two interns training with Bird Uganda Safaris. How do you market your org to students and then to employers? JM: Often times we visit universities and schools (where) we talk to students about the club, its benefits and how they can join. More marketing is done through social media platforms such as our Facebook page. We/our members subscribe to different membership organisations like the Uganda Safari Guides Association (USAGA), NatureUganda and these in a way market us. Bird Uganda Safaris has been quite an instrument in marketing the club and it employs some of our members. Do guides start right out of school or do they come with university or vocational degrees? or both? JM: Most of the courses taught at universities are theoretical and the graduates would still need to go through hands-on/ practical skills training. Most of the trainees are graduates from the university looking for jobs since there is increasing unemployment rates in the country. However they still need to get the hands-on experience as well as theory in the relevant field such as birds, mammals, culture, geography and others. What kind of training does the group provide its members? JM: As of now, we do not have a proper schedule of trainings. There is great power in learning as a group, so we carry out practical skills training at least twice a month where we go out birding as we empower the new ones with skills. These are later supplemented by formal class setting trainings where we work with other tourism stakeholders such as the Uganda Safari Guides Association and the African institute of Tourism and field guide training as well as UTB. We also allocate the new recruits to some of our already established nature guides who are site based where they are further empowered with field skills. Flyer for a skills training day for members of Uganda Women Birders. What kinds of jobs are your members finding? JM: Many ladies have found success through being members of the group, among which are those who have developed into good nature guides while others have developed into tour managers, reservation officers. Often times we give recommendations to our members to work in other tourism related activities. We place/recommend our trained guides to companies. What kinds of resources does the club provide its members? JM: The club was able to attract a donation of 15 pairs of binoculars and some guide books from the Uganda Wildlife Authority and Uganda Tourism Board (UTB). These are borrowed by the ladies who don’t have (their own) to use during their training and practice sessions. This equipment has helped the ladies to further develop their bird identification skills. Does your organization offer scholarships or do students have to finance their training? JM: In most cases students finance their own training. However sometimes, we get fully-sponsored trainings by the Uganda Tourism Board (UTB), United Nations Development Programme (UNDP). Other times we get support from friends and clients of Bird Uganda Safaris which has been our biggest sponsors and appreciate the work we are doing of empowering women. The women birders that are already established such as Harriet Kemigisha sponsor some of the ladies during the trainings. These friends are always willing to support us whenever called upon. How is your organization accredited for training guides? Is there a national standard for nature guides in Uganda? JM: The body currently in charge of grading guides is the Uganda Safari Guides Association (USAGA) to which we subscribe. You're open about the difficulty in being a guide and having a family/being married. Do any of your women guides manage to have a family and work as a guide? JM: Very few women are married and still carry on guiding as a profession. It takes an understanding husband however for the majority it is hard because most of those that get married stop birding. Like in many of the African traditional societies, a woman is charge of taking care of a home, should care for the children (full time mother) and this therefore limits the mobility and commitment to nature guiding which involves being away in the field for many days. I believe if the ladies are earning decent livelihoods from nature guiding activities, then their husbands will not stop them from carrying on with guiding activities. The most successful (professional) woman birder in Uganda is Harriet Kemigisha and she has made it with family and yet raising kids is some of our greatest fears as field women. We (the younger women) all look up to her. 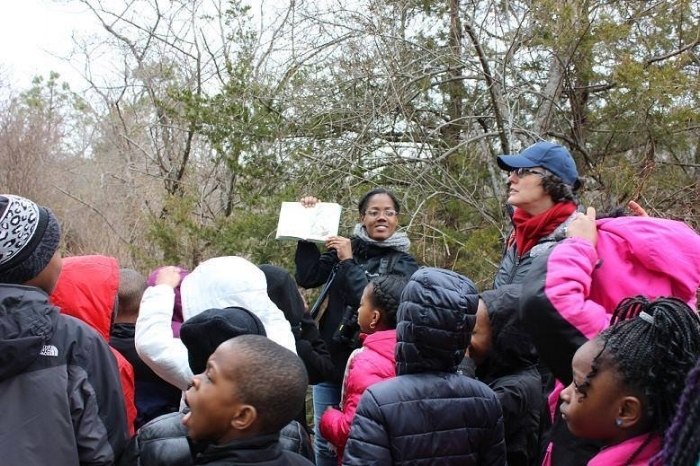 What have you experienced in the way of challenges to being a female nature guide? JM: One of the biggest challenges I have faced is society not believing in us as women. Often times people get surprised seeing us do the jobs ideally “labelled for men”. This in a way reduces the trust and confidence they have in us as women. Flyer for the Second Annual African Birding Expo, hosted by Uganda in 2018. Your group recently hosted some prominent women bird guides during the African Bird Expo, how did that go? Uganda hosted the second African Birding Expo. This was at the Uganda Wildlife Education Center (UWEC)/Zoo (in Entebbe). The event attracted international birders and bloggers who had a 14 days' FAM trip (Press Trip) through the country and preceded the expo. The birders had a lot to share with the Ugandan birders, for instance, Sharon (Stiteler) taught us how to use our smart phones (digi-scoping/phone scoping) to take photos during our trips. The ladies especially motivated our Ugandan women birders and applauded our commitment. We shared a lot of our challenges with these international women birders and they gave us advice and motivation. We are now stronger than ever and are ready to work hard. Women birding guides unite at the African Birding Expo, 2018. Left to right; Munyantwali Christine, Megan Crewe, Prossy Nanyombi, Judith Mirembe, Veronica Nakafeero, Lilian Kamusiime, Jeanisse Nsanga, Abia Atukwatse, Pamela “Waxbill” Giramata Gasana and Sharon “Bird Chick” Stiteler, December, 2018. Photo by Herbert Byaruhanga. Prossy Nanyambi, Mirembe, Pamela “Waxbill” Giramata Gasana and Jeanisse Nsanga at the African Birding Expo, December 2018. Photo by Jeanisse Nsanga. What is your favorite place to take visitors, and what is it they would expect to see? JM: My favorite place to visit is Mabamba Wetland on the shores of Lake Victoria. Mabamba Wetland is an Important Bird Area with over 300 bird species. This wetland has an organized community of local guides who participate in the conservation of wildlife within the wetland and the local communities are in the best position to carry out conservation since they are the custodians of natural resources. It is home to the Shoebill, my favorite species and other globally threatened species such as the Papyrus Gonolek and Blue Swallow. At Mabamba Wetland, one is guided by the local guides from the community who earn livelihoods for their families through eco-tourism and in turn protect the wetland. The iconic Shoebill, at Makanaga Wetland on the shores of Lake Victoria. Mirembe with American client Ross Hugh and local guides at the Mabamba wetlands. Mirembe doing Shoebill research in the Mabamba wetlands along Lake Victoria. JM: I am starting a company; Women Adventures Africa which will provide opportunities for women to work and lead tours. This company will only employ women so as to give them a platform to train and earn a livelihoods for their families. I am working on content for the website. In the mean time for any inquires; info@ugandawomenbirders.org can be used. If you would like to sponsor a woman to complete training to become a nature guide through Uganda Women Birder Association, you can contact Judith Mirembe through Facebook. You will change a woman’s life and promote conservation through your sponsorship. Read more about dynamic women birding guides Regina Ribeiro and Mariel Abreu leading birding trips in Latin America! My daughter gamely trying out the Nikon Travelites binoculars we brought with us. If you’re new to birding, let me tell you that bird counting season is upon us, in addition to all the other festivities as the year ends. And I’m talking about the big count of the year, the Christmas Bird Count. Now going on its 118th year, the annual Christmas Bird Count takes place across the Americas, folks like you and me counting all the birds they see in one day between mid December and early January. The data collected informs conservation efforts regarding the health of bird populations. It’s citizen—or community—science IRL. 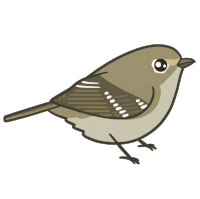 Golden-crowned Kinglet. Photo by Mike Hamilton. The CBC is quite a beloved tradition among birders, and how could it not be? Imagine gathering with other bird lovers, bundled in your warmest clothes and clutching your binocs and a thermos of coffee (and maybe some holiday cookies? ), traipsing through your patch or park or designated count territory, counting birds as part of the oldest bird count in history. For all the bird counting I have done in my life—ten-plus years of monthly bird census in two different Seattle parks with Seattle Audubon—I have never done the Christmas Bird Count (CBC)! It was about time. Fueling up before heading out! 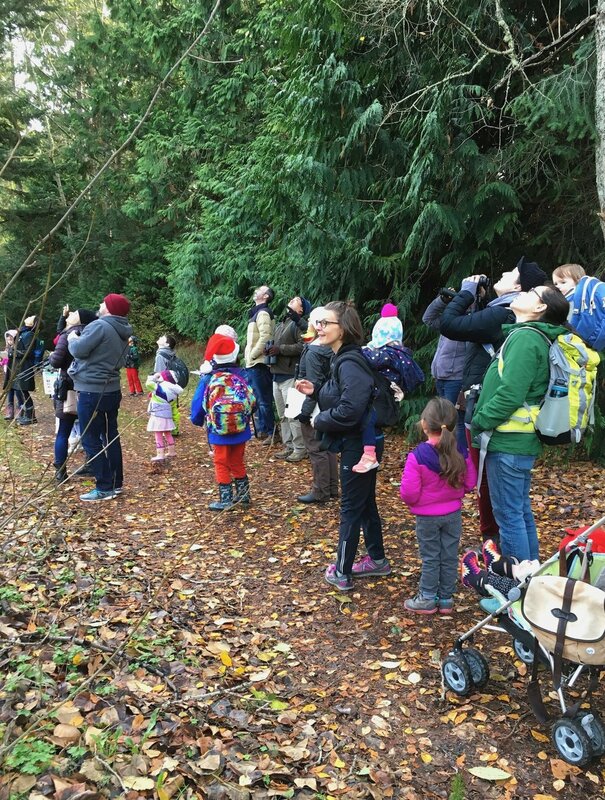 This year, my local Audubon chapter, Seattle Audubon, hosted a Youth Christmas Bird Count, inviting parents like me with younger children not up for an all day count. I jumped at the chance to participate in a less time-intense event than the official Christmas Bird Count taking place on December 29th. I love a good all-day birding trip, don’t get me wrong, but my kiddos do not have the same stamina. My daughter taking in the scene. The younger kiddo crowd (and parents) in the field. Well, turns out neither kid really has the interest, either! While both kids like being outdoors, my son hasn’t taken to my hobby; it’s always a bit of a forced march for him. But he rallied as best he could this time (given that we could not land on a play date for him for him as an opt-out). My daughter is game for most anything but follows the lead of her older brother, which was to play with leaf litter and stomp on snow berries instead of listen and watch for birds. That was OK with me, and thankfully, the rest of the group was OK with that too. Despite my two kids going off course as far as the bird count was concerned, I considered the outing a success, mainly because of the hosting organization, Seattle Audubon. Seattle Audubon provided hot beverages and pastries for participants—essential fortification before heading out on the count. The staff hosted an interpretive table of bird skins to touch while everyone assembled. The start time for the walk was not HARD set in stone! We arrived 5 minutes late and our walk began about 10 minutes later. Time for gathering ourselves and grabbing a cup of coffee (me!) and a scone. Parents of little kids appreciate some forgiveness for not always being punctual! The youth and smaller children were divided into two groups. The older kids went for a longer (duration and mileage) walk than our group of kids 10 and younger. GENIUS. Each child got an illustrated bird list and pencil for checking off what they saw. The 10 and younger group (about 28 of us, including our leader, Etta) meandered over 1.5 miles of wide paved path that allowed the group to spread out or stay close as they preferred (continued below). Little v stomping on snow berries. Big V sneaking some time in his sister’s stroller (that thing came in very handy on this walk). No one objected if kids lagged behind (as in MY children!) or picked up sticks or stomped on snow berries. The open parkland absorbed the modest din of distracted kids so we did not disrupt those birding further ahead of us. The route went past a playground at milepost 1.25, a perfect time for nearly all the kids (ages 2 to 10) to break from the group and play for a few minutes. The Monday following, the staff sent an eBird list to share of the species seen by those who had birded more attentively than me and my kids. The list resembled what birds I recall seeing between playing with my son and daughter (continued below). Black-capped Chickadee. Photo by Mike Hamilton. The Christmas Bird Count is similar to a Bird Walk. For both, there is usually a designated leader who sets the pace and keeps a record of what birds everyone sees. The leader should know the route and be able to tell you how long you’ll be out. The leader may or may not be a bird expert. Other participants may or may not be bird experts. But you all have a love for and curiosity of birds in common. Dress for the weather, be prepared to walk a short distance, and anticipate a couple hours or more outside. Bring optics if you have them, a field guide or field guide app (I like the Sibley one). Bring a stroller or a carrier, depending on the age of the kids (find out if the walk is paved). 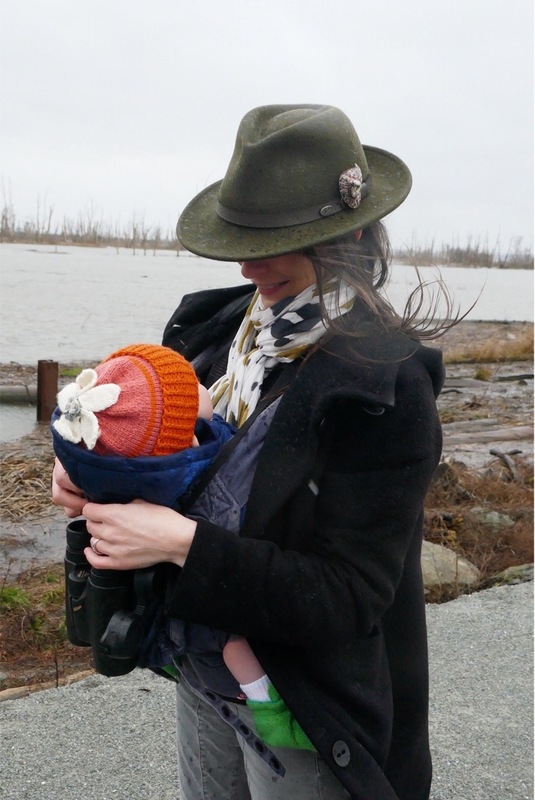 I liked having the stroller since we could stick the bird list in it, as well as lug various supplies with us, such as binoculars and snacks. Know what your kid can tolerate, and don’t force it. My son gave an earnest try at listening and looking for a while and then we fell behind (so we wouldn’t distract the group) and I let him and my daughter play. We trailed the group but stayed the whole time, the kids getting a nature fix that just wasn’t as bird-oriented. 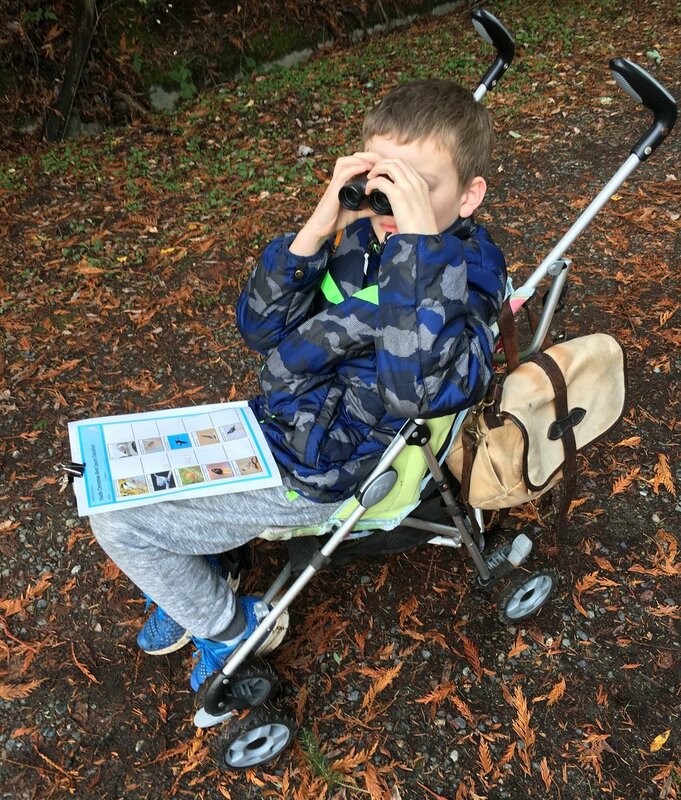 I figure meeting halfway with my son is further along than forcing him to participate in birding the way I understand it. Talk to the other participants! Birding is a wonderful community of people and most birders are nice! And those with kids already share this interest in common with you! Give a look and listen in your neighborhood as the year draws to a close and see what birds are flitting around. Now you know there’s an official count going on to take this same tally. Friend Claire Catania and her daughter with my photo-bomb in the background! For more tips on birding with children, read my earlier posts here. Thanks for reading!